The number one reason people dislike sensitive teeth, is because it gets in their way of eating ice cream. But, do not quote me on that. There are no empirical studies to prove this hypothesis. This is just my hunch based on my conversations with patients. As you may have already guessed, this post is about teeth sensitive to cold. It is also about some available treatments, so we can get you back to eating ice cream right away! 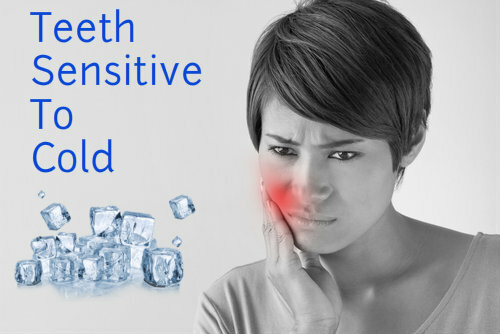 Sensitive teeth to cold can be painful and unpleasant to deal with. In this post, I will cover the most common causes of tooth sensitivity and ways we can combat it. One of the most common reasons for sensitive teeth we find is tooth decay and the appearance of cavities. This is due to the outer layer of the enamel wearing down and the roots of your nerves becoming more exposed. This type of sensitivity is no specific to cold. If the nerves of the tooth become too exposed, chewing hard food, or sugary foods will also cause pain. The next reason for sensitive teeth is fractured teeth. This is often the result of cracks or abrasions in the teeth, also causing the nerves to be more exposed. This can quickly transition into severe tooth sensitivity. Individuals plagued with these issues notice that the use of Sensodyne or another toothpaste designed for sensitive teeth may decrease tooth sensitivity or even stop it completely. These can also help with gum disease, the most common type being gingivitis. Gingivitis causes the teeth to be sensitive due to the erosion of the gums. Another cause of teeth that may be sensitive to cold is worn-down teeth. Tooth enamel wears down over time due to friction and acidic conditions in the mouth. This is why it is so important to brush and wash your teeth/mouth to neutralize the natural acid that accumulates. If a tooth becomes too worn down, this may expose the root, causing severe sensitivity and pain. Exposure of the root is a serious condition that should be mentioned to your dentist as soon as possible. Desensitizing toothpaste contains compounds that help block transmission to your nerves and sensory system. This, however, requires several applications before the tooth sensitivity is dramatically reduced. Another way to combat sensitive teeth is fluoride gel, which strengthens teeth and nails. This, in turn, will reduce the transmission of painful sensations. It can be applied twice a day. Once in the morning and once in the evening. Or, at more convenient times. But, make sure you leave 6 hours between applications. Crown or inlay bonding can also help treat sensitive teeth. This type of remedy may be used to correct flaws and decay resulting in sensitivity. This is something you should see your dentist about, since it is a dental procedure. It is also more costly than the previous two remedied I have listed. The next treatment designed for more severe tooth sensitivity is a surgical gum graft. A surgical gum graft involves helping tissue that has been lost, which exposes the root. Tissue is taken from elsewhere and grafted onto the gums to reduce sensitivity. This is serious dental procedure that can only be performed by a dental surgeon. It can be costly, but it can also improve dental health immensely. The last treatment option we will talk about is a root canal. If sensitivity is persistent and cannot be treated by other means, you may want to ask your dentist about possibly getting a root canal which is a treatment to eliminate the problem. This treatment kills all sensitivity to the tooth. Removing the nerves, leaves the tooth completely numb. However, this type of procedure does not do anything for gum sensitivity. In conclusion, proper oral hygiene is the biggest step in preventing tooth sensitivity. I suggest asking your dentist about any of the treatments mentioned today if you have any questions. Keeping a good oral hygiene routine is the first step in combating your tooth sensitivity. If you suffer from teeth that are sensitive to cold, don’t put up with the problem. Get yourself help in order to leave sensitivity in the dust today. Stay healthy by flossing and brushing your teeth regularly. Teeth sensitivity to cold is avoidable and treatable. But, it is also easily preventable by simply following everyday dental health advice!